It has been a whirlwind first day at Adobe MAX! This morning started off with an exciting keynote and an emphasis on creativity as an essential literacy for students. As a K-12 educator, I spent the keynote with my eyes wide open thinking about the possibilities for student creators. The energy from Sunday’s special Educator Day at MAX overflowed into the morning of the conference’s first day. With a special breakfast for K-12 educators before the keynote, I had a chance to chat with other educators attending this week’s event. Their goals this week are to explore new tools and learn from the experience of fellow educators. At the keynote presentation today, we heard about new creation tools. These will definitely change the way we think about creativity in the classroom. If you followed along during the announcements you heard about the new iOS version of Photoshop scheduled for a 2019 release. This is a powerful way for students to create from a mobile device. In addition to the Photoshop announcement, I was so excited to hear about Premiere Rush, a movie making tool for creatives. Students who are ready to tell the story of their learning through video can use this creation tool for a variety of purposes. As I was listening to an overview of Rush today, I couldn’t help but think of the ways this tool connects to Spark Video— another favorite from Adobe. For students who are ready to take their movie making to the next level, Rush is the perfect tool to explore. There is nothing quite like hearing directly from creative professionals to help you understand the power of creativity in our everyday lives. The keynotes that kicked off MAX gave a voice and a picture of the ways creativity makes a difference in our lives. One highlight from the day was having the opportunity to present on Adobe Spark in the classroom. Over the past few years I’ve shared Spark at conferences around the world. But most memorably spent time side-by-side with students and teachers and they dive into these powerful creation tools. On Monday, Ben Forta, Adobe’s senior director of education initiatives, and I led a session on Adobe Spark in the classroom. This session focused on ways educators use Spark to empower students as storytellers. We examined how Spark Post, Page, and Video are all used in K-12 settings to help students tell the story of their learning. I showed off one of my favorite workflows for Spark that combines these three powerful tools. The theme of the Spark-combo creation I demonstrated was Vermicomposting. First, I created a graphic with Spark Post sharing a tip for getting started with composting with worms. Then, I made a Spark video with reasons why classrooms should consider setting up a compost bin. Next, I opened up Spark Page and added text I had written in a Google doc. For the very last step, I added my Spark post and Spark video creation to the Spark page so all of the vermicomposting examples came together in one place! If you are here at MAX this week we are hosting a repeat of the session on Wednesday morning. The first day of the conference was especially notable because it marks the release of “40 Ways to Inject Creativity into Your Classroom with Adobe Spark.” Ben Forta and I wrote this book and are so excited to share it with educators at MAX and beyond. It’s available in the MAX Bookstore at the conference for folks attending MAX this week to grab a copy, and also available on Amazon. Educators and Spark enthusiasts who are following along at home can take advantage of a special bonus opportunity this week. 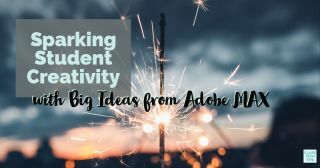 In this post I share the details of the extra videos and graphic organizers you can snag if you purchase “40 Ways to Inject Creativity into Your Classroom with Adobe Spark.” Ben and I can’t wait for you to check it out. There are a few more events on my schedule I’m looking forward to at MAX this week. In addition to repeating our Adobe Spark in the classroom session, I am counting down to MAX Sneaks. This is my third Adobe MAX, and I can’t wait to see what is in store for MAX Sneaks this year. Tiffany Haddish, actress and author, is hosting this event so I know it’s going to be fantastic. Also on my agenda are tomorrow’s sessions related to education. You can find out more about sessions with an education angle on this page created by Adobe Education’s team. If you’re here at MAX this week, reach out to say hello — and if you’re following along remotely, check out my Instagram stories for more of a behind-the-scenes look.